March is definitely the month to see “As The Crow Flies” the award-winning hour long film about my record-breaking Beeline Britain journey and I’ll also be talking about the journey in Crickhowell on Thursday 5th March, and taking part in the ‘Inspirational Women’s Evening’ at the Llanberis Film Festival on Saturday 7th March. Thursday 5th March – Crickhowell Walking Festival – Talk by Beeline Britain team member Tori James at 7pm, Clarence Hall, Crickhowell. Saturday 7th March – Screening of the Beeline Britain film As The Crow Flies at 6pm at LLAMFF (Llanberis Mountain Film Festival) AND Inspirational Women’s Evening at 7.30pm with Elin Haf Davies, Rebecca Coles, Emma Twyford, Becky Shuttleworth, Heather Geluk and myself! 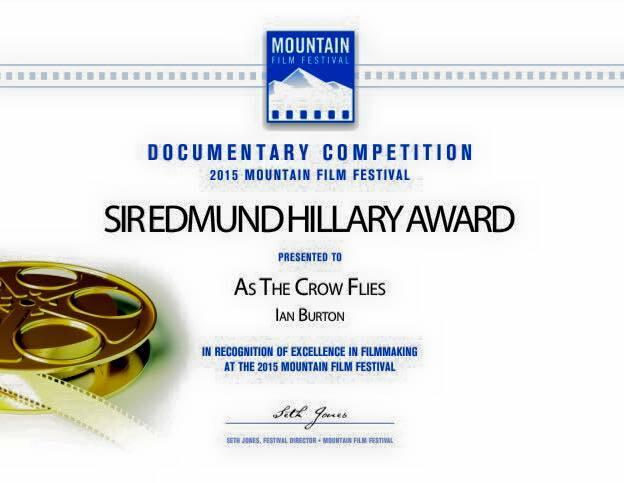 20-22nd March – ShAFF – Sheffield Adventure Film Festival – Screening of As The Crow Flies. Saturday 28th March – Screening of the Beeline Britain film As The Crow Flies at 7pm at Ysgol Dewi Sant, St Davids, Pembrokeshire. Tickets on sale from TYF, Ysgol Dewi Sant and available on the door (£4). If you attend any of these events and enjoy what you see please consider making a donation to Blesma, the British Limbless Ex-servicemen’s Association at http://www.justgiving.com/beelinebritain.